Sensory Mitts are a sensory awareness development tool for swimmers. They are incredibly effective at stimulating sensory receptors during the swim. What is the purpose of Sensory Mitts™? The purpose of Sensory Mitts is to enhance a swimmer’s feel for water. Why are Sensory Mitts important? Feel for water is an essential component of fast swimming. The more acutely the swimmer feels the water, the more efficient he is. The more efficient he is, the faster he’ll swim. Take two equally strong and technically proficient swimmers and the one with better efficiency will swim faster. 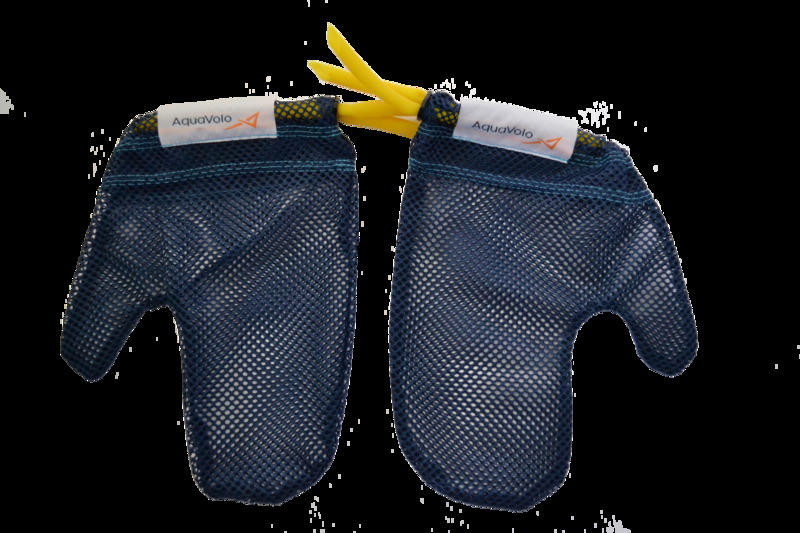 Sensory Mitts help swimmers enhance feel for water and become more efficient. How do Sensory Mitts work? Sensory Mitts work by stimulating sensory receptors during the swim. We made Sensory Mitts from mesh material. When you swim with them on, you can still feel the water as it comes through the holes. As you swim or do drills, the material waves slightly to and fro across the hand in absolute accord with each phase of the stroke, sensitizing the sensory receptors as it touches the skin. Through the increased sensory stimulation during the swim, the swimmer makes an association between the flow of the water and a particular stroke, resulting in an acute feel for water. When can I use Sensory Mitts? You can use Sensory Mitts in all four strokes as often as you like—before, after, and between your main sets. You can use Sensory Mitts when you swim, do drills or scull but you should always try to finish with a relaxed gear-free (i.e. bare hands) swim to reinforce the association between the feel of the water and your stroke. How long does it take to feel the effect of Sensory Mitts? Frequently, a hundred yards of swim or drills is all that’s needed to stimulate the sensory receptors on your hands, although each person is different. Always try to finish the Sensory Mitts set with an easy swim without gear (i.e. bare hands). This will reinforce the association between the feel of the water and your stroke.